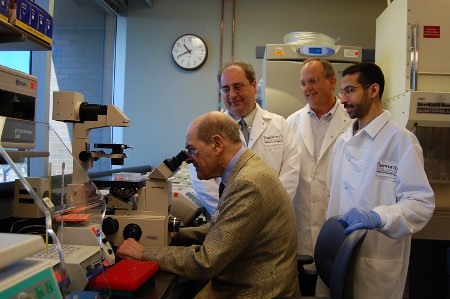 My father (seated) inspects lymphocytes involved in developing new cellular therapy for transplant patients. Deaconess Assns. Foundation and the Heimlich Institute donated $115,000 to the Hoxworth Blood Center to complete a $615,000 award for the study. From left are Hoxworth researchers Jose Cancelas, MD, Ph.D.; Tom Leemhuis, Ph.D.; and Naseem Almezel. 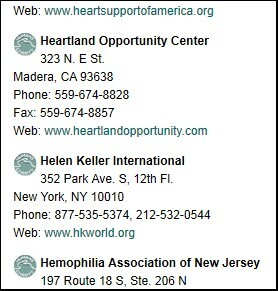 * 5/14/12 update: According to the Heimlich Institute, the total awarded to UC was $615,000. What made this interesting is that a high-profile Washington, DC-based animal rights advocacy group called the Physicians Committee for Responsible Medicine (PCRM) had long included the Heimlich Institute on their list of approved charities that "(do) not fund or conduct animal experiments." 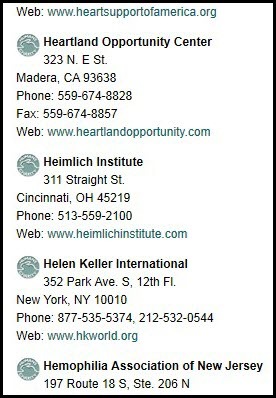 The Heimlich Institute is now MIA from PCRM's list. Here's a screen shot I grabbed last month. At this writing, the same information is still visible in Google's cached version of the page. Over the past few weeks I sent multiple e-mails to PCRM founder/president Dr. Neal Barnard and to two of his organization's media representatives, but never received a reply. As of tonight, my father is still listed as a member of PCRM's medical advisory board. I have no information whether or not PCRM intends to continue to present its Henry J. Heimlich Award for Innovative Medicine which the organization established in 2005. Heimlich personally decided to help fund the research being done at Hoxworth. When Heimlich decided to make such a donation in the name of research at Hoxworth, Deaconess decided to contribute to Heimlich's donation. "Doctor Heimlich personally saw the potential in the research of Dr. Leemhuis and Dr. Cancelas," said Patrick Ward, executive director of Deaconess Associations Foundation said. This photo at the beginning of this item has been updated.